Congrats! If you made it here it means that you know how to start a Blog, choose the best blogging Platform for your Christian Blog and succeeded to install WordPress. But before you can get started on filling your site with content there is one important thing you need to learn: How to master SEO on your Christian Blog. Search Engine Optimization (SEO) is the annoying but super important task of improving your visibility on search engines such as Google, Bing or Yahoo. Quality traffic from organic searches on the internet, improve the performance of your blog and help you share your knowledge with the world. By learning how to master SEO you make it easy for Google and other search engines to index and crawl your Christian Blog. That means to put your information together correctly so that people searching for the kind of content you offer are referred quickly. Luckily, if you chose WordPress that won’t be too hard because it offers multiple free SEO Plugins that help facilitate the optimization. Like many other bloggers, I use Yoast SEO. 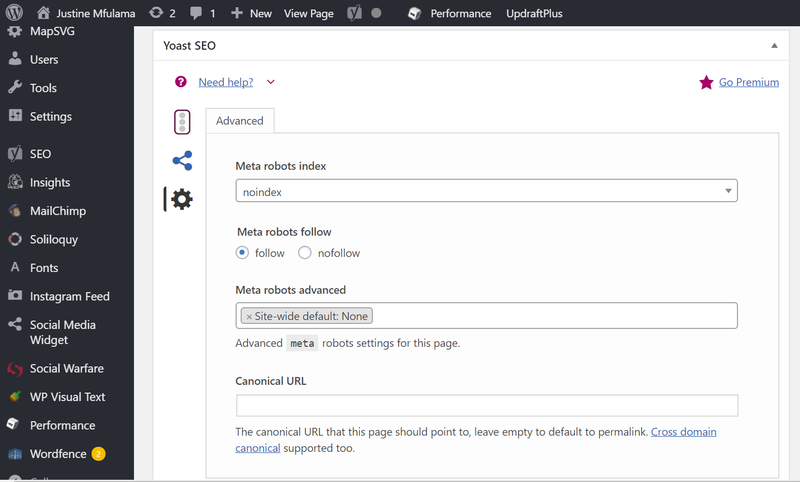 The free WordPress Plugin is easy to use and includes all the important SEO techniques. The first thing you want to ensure is that the URL of your page, correctly communicates to Google what your blog post is about. This is done by choosing a generic URL structure for your blog. 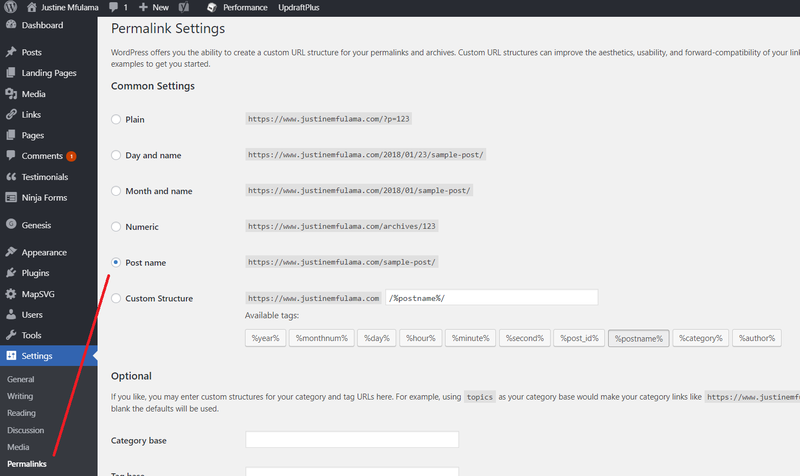 Go to the left-hand column of your WordPress Dashboard and then navigate to Settings – Permalinks and set the URL structure to “Post name”. From now on when you publish a blog post, the URL will always include your website name followed by the post name: http://www.mysite.com/mynewestpost. When people search for your blog they are redirected to a page that shows each search result. On that page, each website that is linked to the search term is presented, including a search description. This description gives readers an idea of what your blog is about and if it is beneficial to their search. Therefore, that search description should include your main themes, niche keywords or primary products. 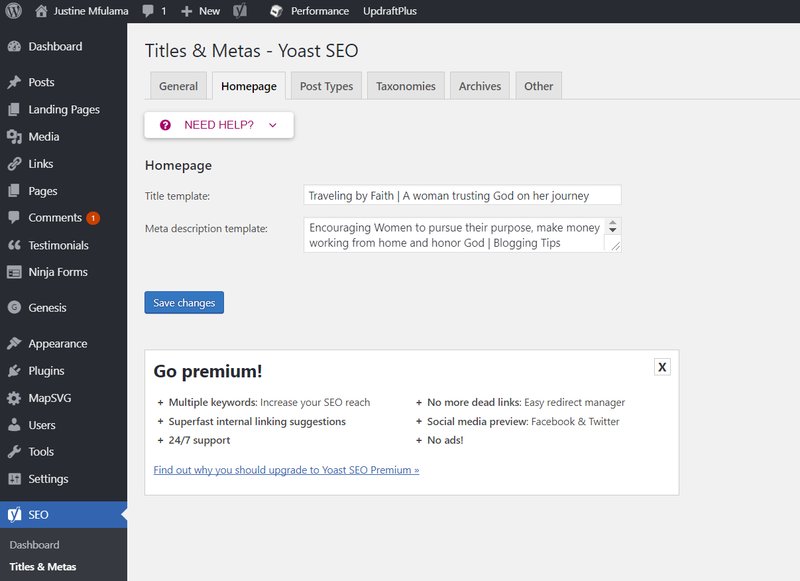 Thanks to Yoast SEO, the search description is easily edited under SEO – Title & Metas – Homepage. And while you are already on that page you may as well fill out the Meta description for your Post Types in the next tab. This is the generic description that will show on search engines if you don’t customize it for each post (which you should always do). Next, you want to make sure that search engines only index your quality pages. These are the pages that are important to your blog and offer the most information and content i.e. your blog posts, homepage etc. To avoid that your categories, tags, and archives are included in Google searches, you must set them as “no-index” pages. Navigate to SEO – Titles & Metas – Taxonomies. Here you will find the settings for your category, tags, and archive pages, which you should set to “no-index”. They are helpful for internal navigation but are not useful to search engines. To get to your pages, click on ‘Pages’ in the left-hand column of your WordPress Dashboard. Scroll below the page entry and click on the advanced feature tab. Choose “no-index” and “follow” on pages you do not want to appear in Google search results. Now that know how to master SEO on your Christian Blog you can start filling your site with content. However, be sure to use the Yoast SEO plugin to optimize your posts. Follow the plugin’s recommendations for Readability and SEO improvements at the bottom of the page to receive a green light. 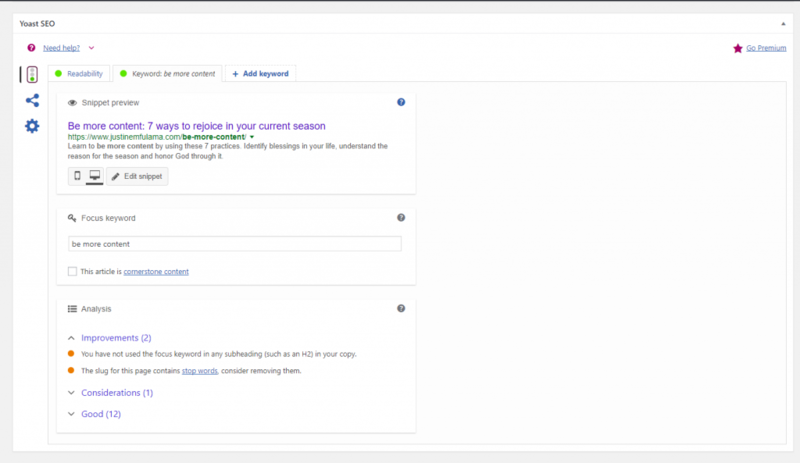 Of course, there is way more you can do to master SEO on your Christian Blog. However, if you follow these 5 steps you are on the right track as a beginner blogger. New to Christian Blogging? Let me know what you find the most challenging so far, BELOW! This is such a helpful post! I did tip #1 before I left my comment – so easy! I already optimize with Yoast and I’m planning to come back and review the other three later when I have a little more time to focus on it. Thanks! I needed this! Thanks so much for the tips 🙂 SEO is one thing I need to improve for sure! Oh, man! I guess I didn’t know everything about SEO. Thanks for the tips! Thank you! I’ve been blogging for a few months and need to really work on SEO. Great read and helpful! SEO is something I need to get better at. I am pinning this for future reference.! Same here. It’s super important but so confusing at times. I haven’t heard of the no index pages, thanks for the heads up! I’ve just re-started my blog, so this gives me some helpful ideas to get improved visibility. Thanks for sharing! Yes get started right away. Having to do it later is sooo much work. Oh my goodness, Justine!! You have a gift for teaching! This is hands-down the best blogging tutorial I’ve ever read! Also, I’ve been doing all the Yoast SEO recommendations on individual posts for awhile because all the other tutorials pretty much just tell you to do that. But I hadn’t done most of the things you recommend here. So this was REALLY helpful and informative. Thanks SO much, and keep up the good work! How interesting. I need to optimize my blog so that I have better SEO! This was very helpful! I am brand new to blogging and I’ve been looking for help with SEO. You have shared such easy step by step tips. Thank you. Headed to my blog to put this into practice. Great seo tips! It really helped me. Thanks! This is great! The pictures are very helpful in explaining what you are trying to teach. I may have to come back to this and see if I am SEO’ing to the best of my ability. 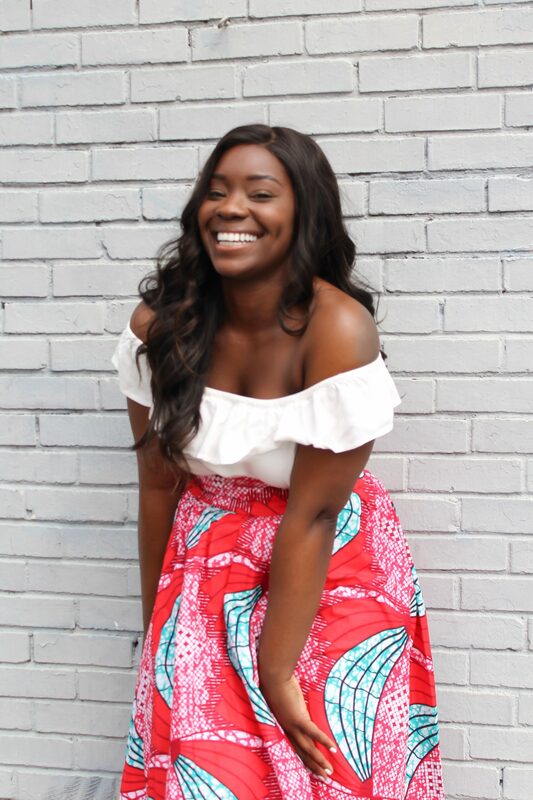 Hi Justine – you’re blog is beautiful :-). Thanks for sharing these helpful SEO tips. You make it so simple! 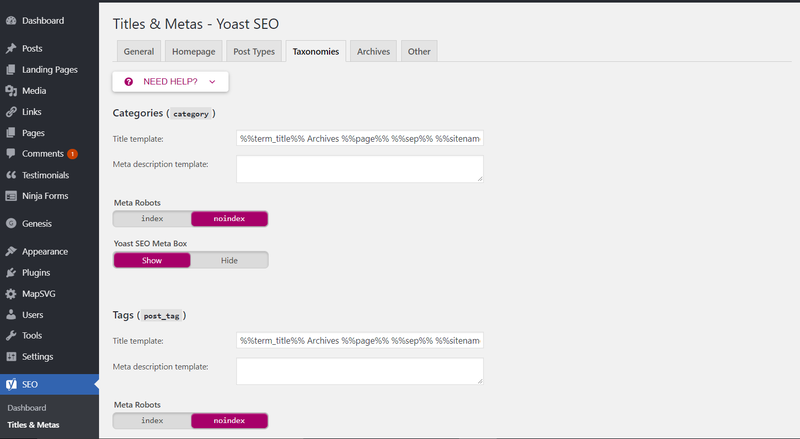 I use Yoast and it is a great plugin to improve search results. After reading your post I realized I definitely need to check my nofollow info on the lesser pages. Those screenshots made it easier like never before. Great post! So helpful for many of us…Before I started a blog, I had no idea what SEO even meant. Thanks so much for this! Hey Justine, thanks for such useful SEO Tips. Many people overlook Categories, Archives and Tags, they are also Important when it comes to optimizing your site for Google Search. Well written article. I think anyone can follow these tips and be able to start optimizing his or her site immediately.